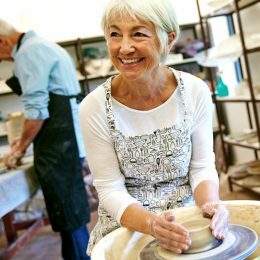 Meet the 2018 SilverSneakers Instructor of the Year! For the past 34 years, Margaret Agnew has taught people of all ages how to be stronger, happier, and healthier. And she’s just getting started. Two years ago, Margaret Agnew made a pact with her doctor. We’d like to see Agnew’s bosses at the Apex Parks and Recreation District in Arvada, Colorado—or anyone else, for that matter—try to kick her out. 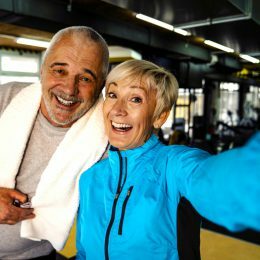 For 34 years, Agnew has taught people of all ages, but especially seniors, how to be healthier, grow stronger, and fight father time. Her weapon of choice: fitness. 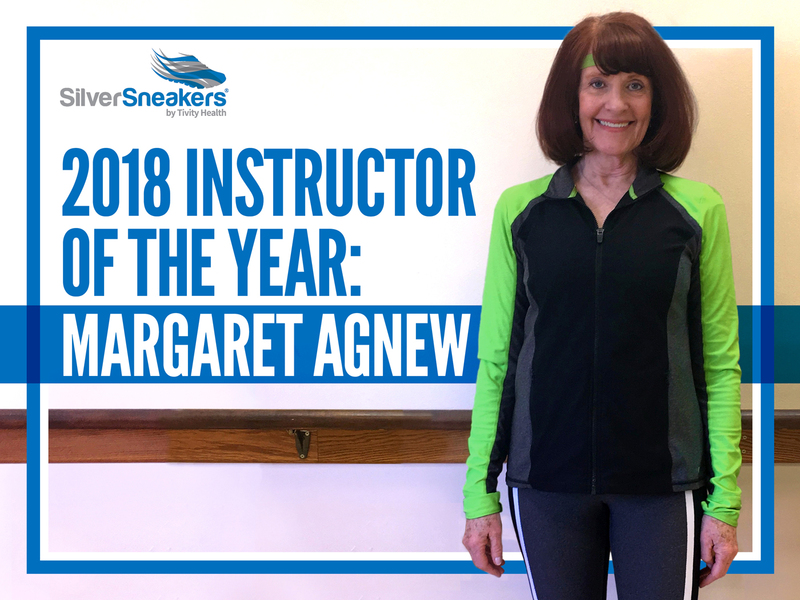 Whether she’s leading weekly SilverSneakers classes or guiding clients in one-on-one personal training sessions, her relentless, enduring dedication to helping her students live their best lives makes her the 2018 SilverSneakers Instructor of the Year. Ask anyone who’s ever broken a sweat with the bubbly trainer and they’ll say Agnew’s work is more than okay—it’s transformative. Follow her five-step fitness philosophy and you’ll understand why. Agnew has always had an active streak. She graduated from her Southern California high school several years before Title IX passed, which meant she couldn’t play varsity team sports. Instead, she participated in as many intramural leagues as possible. She continued to fill her athletic resume at Brigham Young University earning a physical education minor. You name the sport—tennis, basketball, field hockey—Agnew kept an active pace. She didn’t slow down until she and her now-husband, Bill, moved to Denver after college. Over the next decade, she worked her full-time job: raising four children. Shortly after giving birth in 1982 to her youngest, Jason, Agnew realized it was time to start sweating again. “A friend of mine was also a mother of four, and she said, ‘We really need to get back in shape,’” Agnew says. So the pair signed up for an aerobics class at a local health club. Before long, Agnew was teaching it. Though the owner has since passed away, his wife still comes to Agnew’s classes. “I thank her all the time,” she says. Throughout the ’80s, Agnew kept adding new classes to her repertoire, including weightlifting, spinning, and kickboxing. She even brought in new recruits from the local Westminster Fire Department to whip them into shape so they could pass their physicals. (Yep, she’s just as tough as firefighters.) Agnew has a say-yes-to-everything attitude, which is why she jumped at the chance to start teaching seniors in 1992. She hasn’t stopped since. If Agnew hooks her students in with her cheery demeanor, she keeps them coming back with her serious commitment to education. 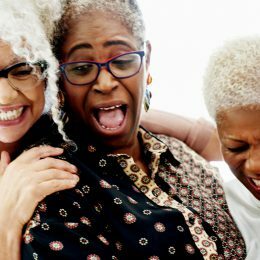 Agnew updates her curriculum every week, pouring over the latest research to make sure she always knows the most efficient and effective ways to help seniors stay fit. Though Agnew loves helping others, she admits she’s passionate about fitness for a selfish reason, too. Late in her life, Agnew’s mother had severe osteoporosis. She died at age 90. “In her x-ray, doctors could see her spine was broken in seven different areas,” Agnew says. “Because of that, I’ve just been paranoid about keeping my bones healthy. And our bones can only be as strong as the muscles attached to them. It’s why I’m determined to stay as strong as I can for as long as I can,” she says. Dementia also runs in Agnew’s family; her paternal grandmother, aunt, and uncle all had the debilitating disease. That gives her extra motivation to keep moving. Agnew’s busiest day of the week is Thursday, when she teaches four 55-minute classes and three 1-hour training sessions, with few breaks in between. That’s a crazy schedule for anyone to maintain, let alone someone who is pushing 70. But Agnew is just as eager to dominate her day, every day, as she was when she taught her very first aerobics class 34 years ago. How could she possibly give it a rest when she has more energy than ever?